Grayton Beach State Park has one of the finest beaches in Florida. It is located about 30 miles east of Fort Walton Beach. The beach here on the blue water Gulf of Mexico is of brilliant white sand. It has been listed on several "best beach" lists including America's Best Beach and Florida Backroads Travel. Boardwalk crossings guide you across the high sand dunes from the cool shady park with its canopies of oaks and magnolias. After you've arrived at the beach you can sunbathe, swim, fish in the surf or just take a nice walk. The park itself also provides canoes and kayaks on Western Lake where you can learn more about the park's salt marsh environment. You can launch your own boat, kayak or canoe at a boat ramp on the lake, and nature trails meander through the coastal woods. The whole place is very beautiful and peaceful. There are trails for hiking and cycling. If you want to stay in the park for awhile and visit other attractions in the area, the park has a full facility campground including camping cabins. 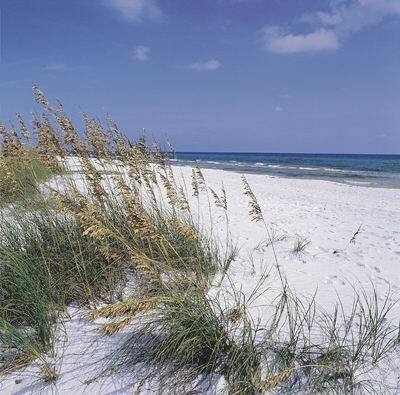 Places you can visit while staying here include Seaside, Grayton Beach and Fort Walton Beach. The park is open from 8:00 am to sunset every day. Fees for camping and other amenities of the park are available at the Florida State Parks website. For general information about the park, please call 850-231-4210. Campsite reservations can be made through ReserveAmerica.com. This park is located South of U.S. 98 approximately halfway between Panama City Beach and Destin. Take county road 283 south of U.S. 98, turn left at the stop sign on 30A (approximately 1/2 mile east of the intersection of C.R. 30A and C.R. 283 park entrance will be found on the right).